The Flatiron is a 6 mile round trip hike highly ranked by most hikers. If switchbacks are your passion this hike will show you the flip side. It's a push (almost a climb) to the top, but well worth it. From the Siphon Draw Trailhead in Lost Dutchman State Park head out on the trail. The first section is across the Discovery Trail. 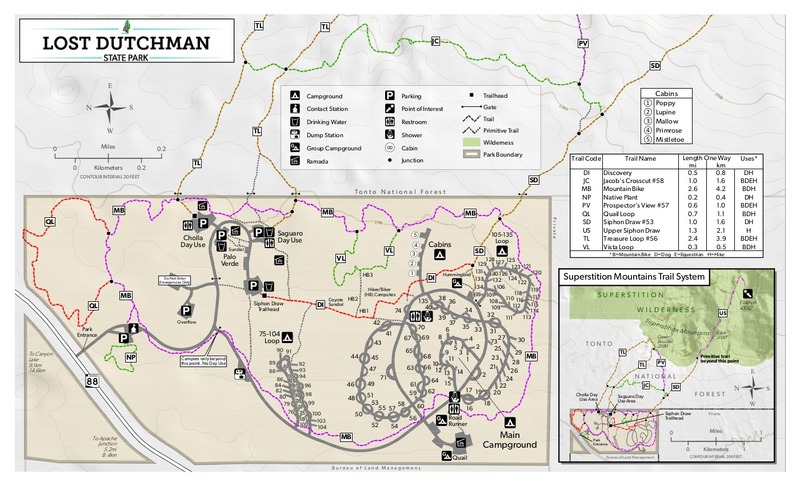 Next it's up to the boundary between the State Park and the Superstition Wilderness. Hiking is easy up the gentle meadow slope. After a mile the trail turns to your left. A canyon opens up in front of you. This area viewed from a distance appears to be solid. Now you know the real story. Continue hiking another quarter mile to the slick rock area. You will find a mini waterfall after a rainy night. I've seen a little water running even weeks after the last rain on several trips. Keep in mind this area is a wee bit scary with a wet surface. Be careful! This is the turn around point for anybody in their right mind. Okay, can you really turn around here and miss all the fun. Not me! Continue up the canyon right of the waterfall area. When you return down this section avoid going straight down. Pretend like there's switchbacks and zig zag down the slope. Okay continue on following the wash up. If you haven't figured out what the Flatiron is, it's that huge mass looming over your head to the right. After the waterfall section, you'll top out on a mini rise. There should be a canyon dropping out ahead and THREE vertical canyons leading to the top. Take the far right canyon up to the Flatiron. Stay out of the other two canyons. There's a section or two requiring you to pull yourself up. Be careful not to go up something you can't get down from. Just before topping out is a ten foot section nearly vertical. Other than that there shouldn't be a lot of rock climbing, if so you're off the trail. When you first top out on the ridge get to know the area. The way back down can be hard to find if you loose orientation with the area. 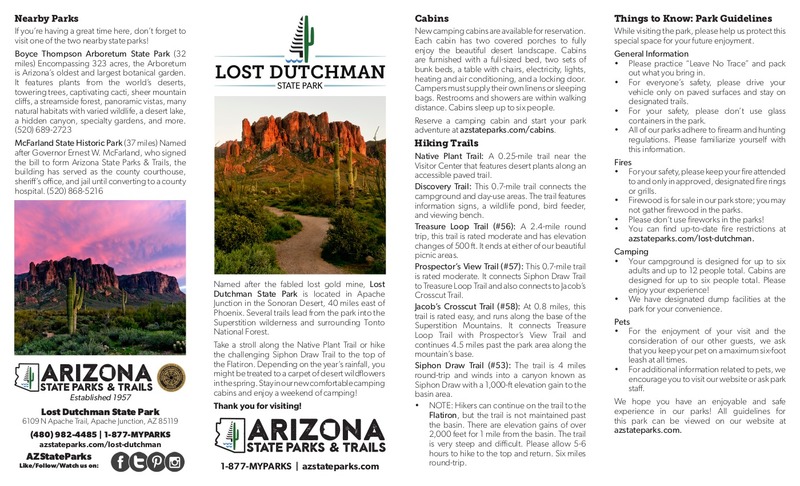 Follow the trail "that actually exists" to your right and around up to the tip of the Flatiron. The views are awesome! The sheer drop off is mind boggling. Return back down. You'll find it takes more concentration coming down. On your way home, look back at the Flatiron. It's hard to believe you actually hiked to the top! Go after a wet winter in 70 degree weather for nice desert flora. Spray painting or permanently marking the route is defacing the wilderness. If you witness this type of illegal activity report it to the Tonto National Forest (602) 225-5200. From Mesa follow Highway 60 East to Idaho Road. Turn North onto Idaho Road which is SR88 and follow North. SR88 bends right just past Scenic St. and Idaho continues North. Be sure to go right and stay on SR88. Continue following SR88 past the old Bluebird Mine to the Lost Dutchman State Park. Turn right into the park.